RL's journey to become one of the country's best loved authors is just beginning. 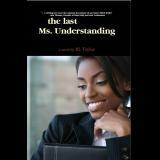 His debut release,The Last Ms. Understanding, has recieved high praise from every remote corner of the country. Rita Clark is a wealthy business executive that has relocated to a new city. She’s acquired every luxury a woman could desire. A visit to a local jazz lounge brings her face to face with Lee Johnson. and into a blue collar job. and the former athlete may be the change she’s seeking to find. while Rita becomes consumed by her flourishing career. and right his past wrongs. the glass ceiling in her male dominated field of work. But that would mean relocating overseas. Rita is forced to choose between career and love. The dilemma lies in Lee’s secretive life that he’s hidden from Rita. Once exposed – Can Ms. Rita Clark be understanding?